“Artists who grew up in Beijing tend to have a deep relationship with traditional Chinese culture, as well as a subtle and accurate understanding of everyday political life. 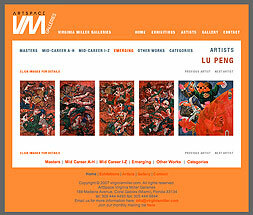 Both of these are seen clearly in Lu Peng’s art…(he) has been deeply affected by traditional drama, martial arts fiction, electronic games, and Hollywood films…His works enable us to process the confused state of today’s culture and comprehend it in terms of adventure stories, painting with absurd humor and a sense of violence,” according to Zhang Zhaohui, art critic and director of Joey Art Gallery, Beijing. Lu Peng’s half-naked women “represent the psyche of some modern-day Chinese women, handcuffed by both the angst of contemporary life and the constraints of traditional ideology,” Zhaohui observes. The writhing bodies “portray people stuck in cultural interstices,” those who have lost touch with their own cultural base yet fail to identify with the contemporary alternative.